From the start of the season through Thanksgiving, I fully embrace and adore the pumpkin spice latte. No other flavor gets any love when the PSL is available. And then turkey coma kicks in, the clock strikes twelve and madness ensues at Walmart. That’s my cue to switch to peppermint mocha. And leave Walmart. I’m not a huge fan of candy canes by themselves, but stick them in a cup of cocoa and it’s love. 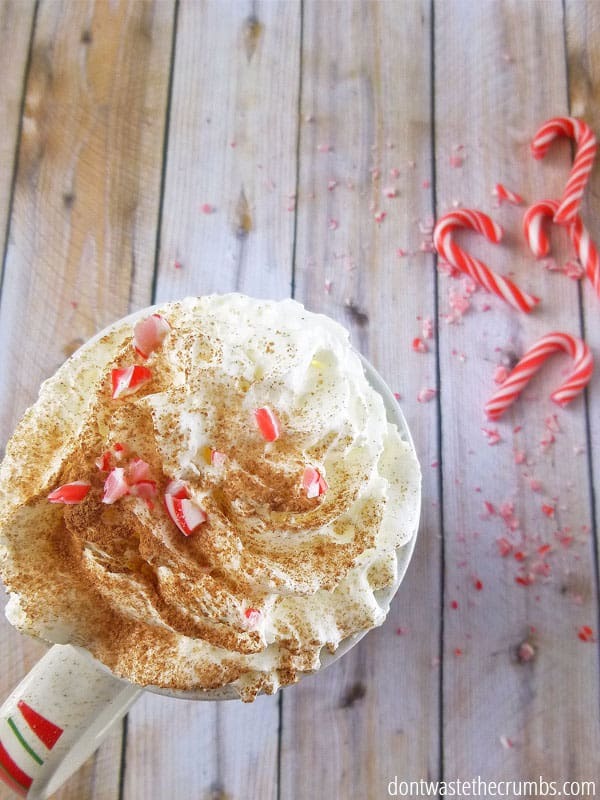 Honestly, can there be a better way to start the day than candy canes and cocoa in your coffee? 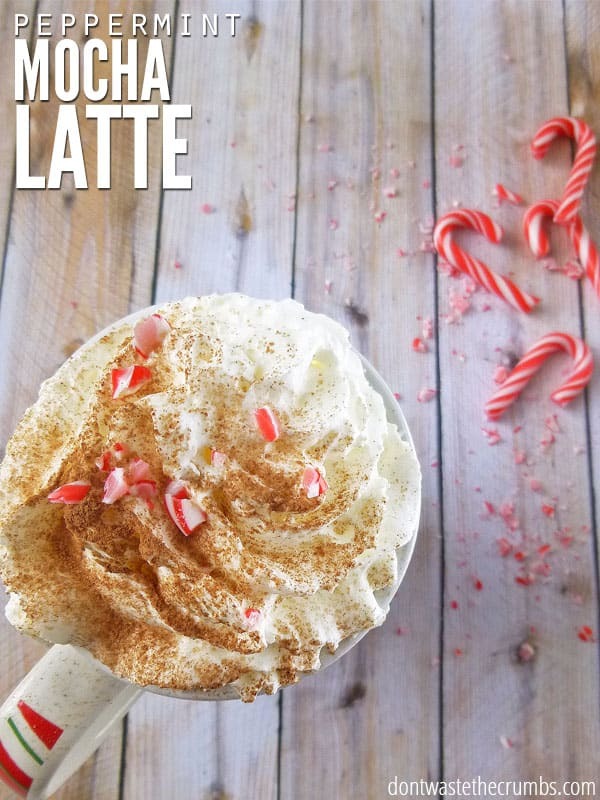 This peppermint mocha latte recipe comes with a few different variations, depending on what you stock in your pantry and your personal beliefs about consuming candy before 7am. Obviously, I don’t have an issue with it, but then again, we eat cookies for breakfast too. Two of the variations are made entirely with real food. Make one of those if you’ve already eaten too many cookies so far. PSST – If you don’t want to curb your consumption of cookies this season, Nourishing Cookies for a Healthy Holiday is my go-to eBook for healthier cookies that don’t taste healthy. The third version of this peppermint mocha latte recipe has just a hint of processed sugar, but then again, when you’re making healthy cookies, a little bit of sugar isn’t a deal breaker. And if you think about it, this homemade version is quite a bit healthier than the Starbucks favorite. Even if you use a little processed sugar. Whichever you decide, enjoy thoroughly and smile. You’re enjoying a peppermint mocha latte in your jammies and you didn’t even have to wait in line! To make a latte, choose your option and combine ingredients in a mug. Add remaining ingredients and stir well. Enjoy! To make this recipe a little more on the frothy side, you can add your ingredients to a mason jar and shake well. This gives it a bit more froth and mixes up those ingredients really well. Be sure to use a towel when holding the mason jar. It can get hot! This recipe works really well as hot chocolate too. Omit the cocoa powder and add the other ingredients to your favorite hot chocolate recipe. Need to make this dairy free? Check out this huge list of dairy-free milks you can make in the comfort of your jammies too! Not a fan of PM? I’ve got you covered there too! 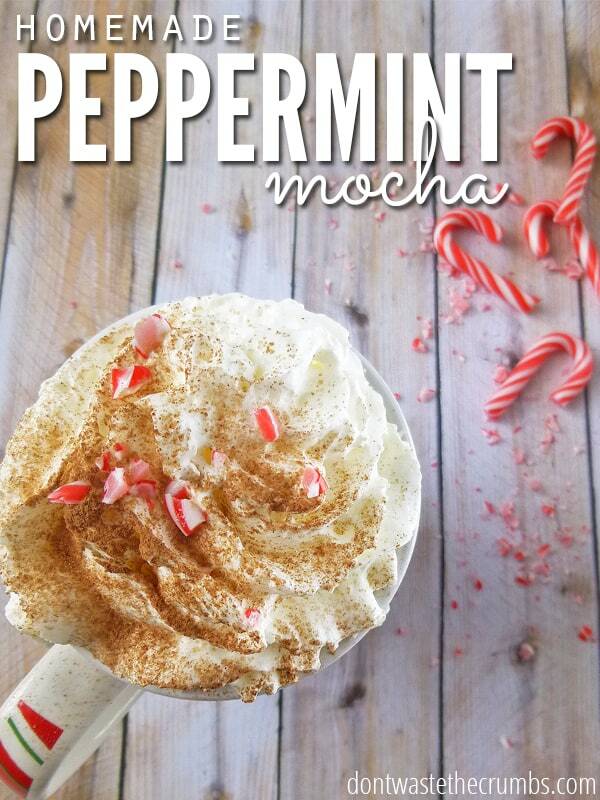 How do you feel about the Peppermint Mocha Latte? How do you feel about Walmart at midnight on Black Friday? « Looking for a Healthy Christmas Cookie Recipe? I’ve Got You Covered!! Peppermint Mocha? Love it. Already drinking it. Walmart on Black Friday? No, thanks. I do go Black Friday shopping but that is the ONE store that I will not go to. Now, the day after Christmas, yep you will find me there, buying the perfume sets at fifty percent off! I’ll be with you in spirit! YUM!! This looks delicious! I didn’t even know they made flavored stevia!! I’ll definitely have to make this. Thank you!! Made this today, and was not pleased. It tasted really bad. Sorry! But if I were you I wouldn’t waste my ingredients making this. I’m sorry you didn’t like it Ruby! Can you be more specific? What part didn’t you like? WOWee, you just made my morning with this recipe! What an excellent susbstitute for the peppermint mocha I adore from “5 Bucks.” I didn’t have peppermint stevia or candy canes so used: 1/8 tsp peppermint extract, 2 Tb maple syrup, 1/2 tsp vanilla, and 1 tsp cocoa powder. Tried it first with 1/2 cup almond milk and it was okay, but I made it again using 2Tb half n half and BINGO! Your article had me laughing so hard…I’m with you!! LOL, Would you believe I had to go back and re-read what I wrote? LOL! I’m glad you enjoyed this recipe Kari. It’s one of my favorites this time of year, and even more so that I don’t have to pull out a blender or pan or anything else first thing in the morning. Just pour, tip and stir and I’m good. Thank you for sharing your version – it sounds so decadent!! I am so excited to try it but was wondering if you think I could use peppermint essential oil instead of Stevia or crushed candy canes? Hey Tiff! You’ve inspired me!! Please check out my own version of a mocha latte on my youtube channel Brittflix 🙂 it may not be as good but it may be worth trying. I didnt have stevia so used honey and almond milk. The peppermint oil i had was very strong. Had to add more cocoa. It was ok. Ill try it w stevia and peppermint candy next time. Thanks so much for the recipes! I’ve always loved the frappuccino, since my American dad used to bring them home for me from 711 on his way to work (He worked the early shift at Census in Washington, DC). I haven’t had a frappuccino since 2012, the last time I went to Baltimore, unfortunately the last time I saw my American Dad alive! He died seven months after I came home from Baltimore. Which brings me to my question. Do you have a recipe for the mocha frappuccino? I think that’s the one daddio always got for me. It was either the mocha one or the original coffee one. It came in a pack of four glass bottles. Better yet, he always brought home a box of doughnuts to go along with them. Aww man, doughnuts and frappuccinos make a classic combination!